Epoxy floors or epoxy flooring provide you with a durable and reliable surface, which is fit for industrial and commercial purposes. These epoxy floor coatings are generally placed over the concrete flooring in order to make the surface durable and smooth. These coatings make the floors have high performance and long-lasting. Most of the warehouses, commercial buildings, and industrial buildings have resorted to epoxy flooring. This helps them to maintain the floors perfectly because it does not require much care. There are various kinds of epoxy floors, namely, 3D epoxy floors, metallic epoxy floors, etc. The coatings of epoxy basement floors require a surface that is mildly porous and clean. There must be no chips and cracks on the floor, so as to have a durable solution. What Is Meant By Metallic Epoxy Flooring? These metallic floors can be installed very easily and are quite affordable. 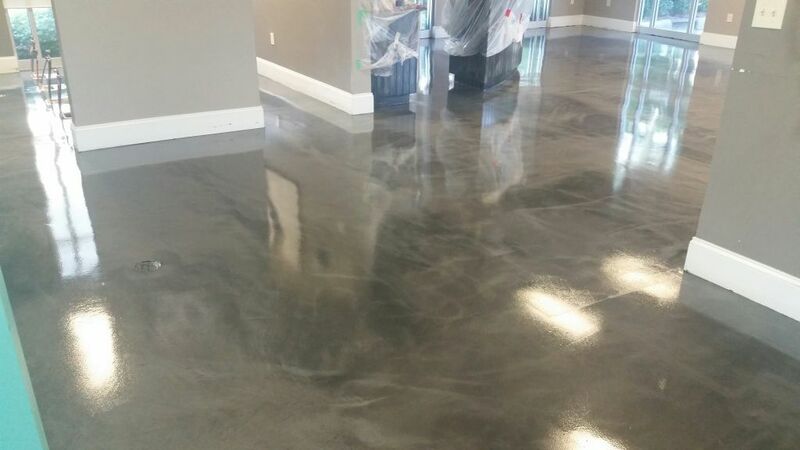 Floors having pure metallic epoxy floor coating have an epoxy built of two components and are completely (100%) solid. This is an epoxy of a special kind, formulated by a pigment which is metallic and appears pearlescent. This is applied to the floor using a squeegee or a roller. The final results are extremely aesthetic. They can be used in garages, restaurants, stores, museums, offices, bars, basements, salons, etc. Such a kind of coating demands a coating of primer as well as 100% percent solid metallic basecoat of epoxy along with an effects kit. Lastly, a clear coat of UV-resistant epoxy is needed too. After the application is done, it has a smooth finish that resembles a glass surface. It is not too lustrous and has a sheer subtlety to it. The techniques that can be used for the creation of various personalised styles are almost endless. Some people who have used metallic epoxy floors opine that they can be used to create three-dimensional structures like that of a lava lamp, craters of the moon, strikes of lightning, glitter paint which appears shimmery, etc. Listed below are the various types of color combinations that can be created. Same Colour Effect: The same color effect is created when one uses the same colour for the pure metallic effect and the pure metallic basecoat. Two Tone Effect: The two-tone effect is created when one uses a different colour for the pure metallic effect and the pure metallic basecoat. Two Colour Effect: The two-colour effect is created when one uses a certain colour for the pure metallic basecoat and two different colours for the pure metallic effect. More colours can be used but it ends up making the appearance muddy and clumsy. So, using two colours is recommended. However, more variations can be added if you are willing to. 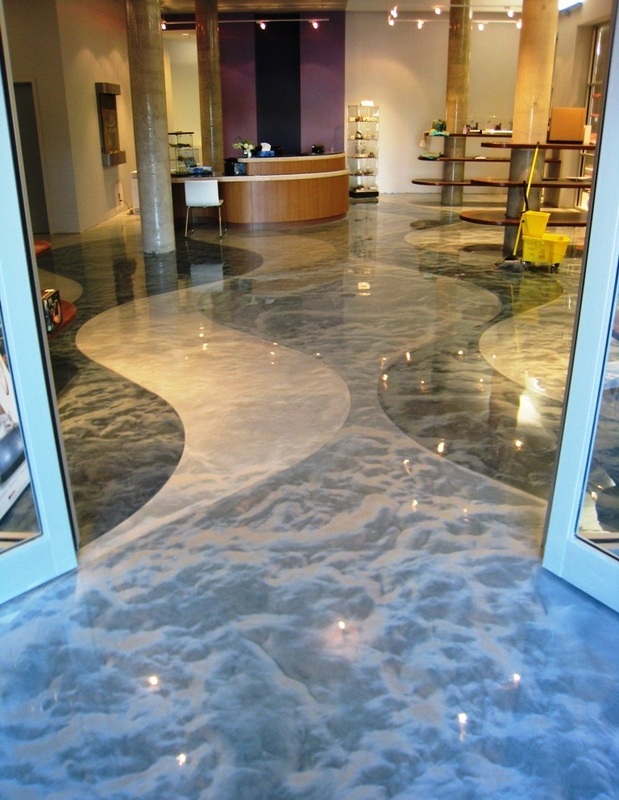 What Are The Advantages That Come With Epoxy Floors? Application of epoxy coatings will make the surface have a shine to it. The glossy surface is quite attractive to look at. The brightness of any area is also increased with the epoxy floors, as much as two hundred percent. The epoxy floors are extremely easy to install. To add to this, the installation does not require much time. The surface that the epoxy floors provide are durable, hard wearing and have the ability to endure continuous and heavy traffic. The surfaces are pretty easy to clean and maintain. This also makes them extremely durable. These type of floors are ideal for applications in the industry and warehouses. At times, no paint is required to be applied over the epoxy coatings. They have the power to resists water beads, stains from oil, etc. This is why it is pretty easy to wipe off any dirt or grime and keep the surface seamless and sparkling. If the application of the epoxy floor is proper, they can last for quite a number of years. These epoxy mixtures can be easily combined with colours and paints in a bid to mask off cracks and chips. These floors provide a surface that has chemical resistance. This is the reason why such kind of floorings is apt for plants which deal with tasks related to manufacturing. They have high friction which is why they make for an anti-slip surface. This enhances the safety of these floors. They are also resistant to heat and fire, which is absent in concrete floors. Different patterns of epoxy flooring can be mixed in order to create driveways. They can also be used to build walkable areas. They help in the prevention of wear and tear on the concrete floor that lies beneath it. In today’s age, what we need is an eco-friendly solution to every problem. These floors fit that criterion perfectly as they are considered to be an environment-friendly solution. Some of these products can also be combined with the products that are used for the purpose of self-levelling. This mixture can then be applied to old or new concrete. They do not require any major maintenance. They are really affordable and is pretty easy on the pocket. 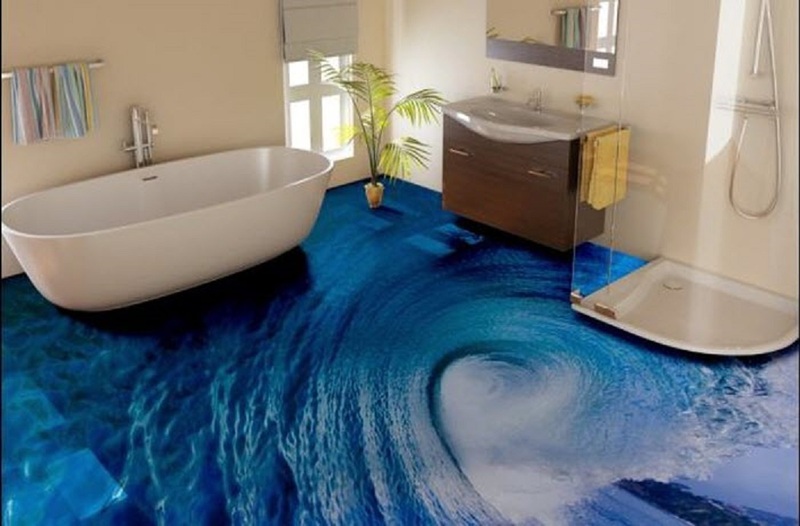 You can create three-dimensional effects in your room using 3D epoxy floors. 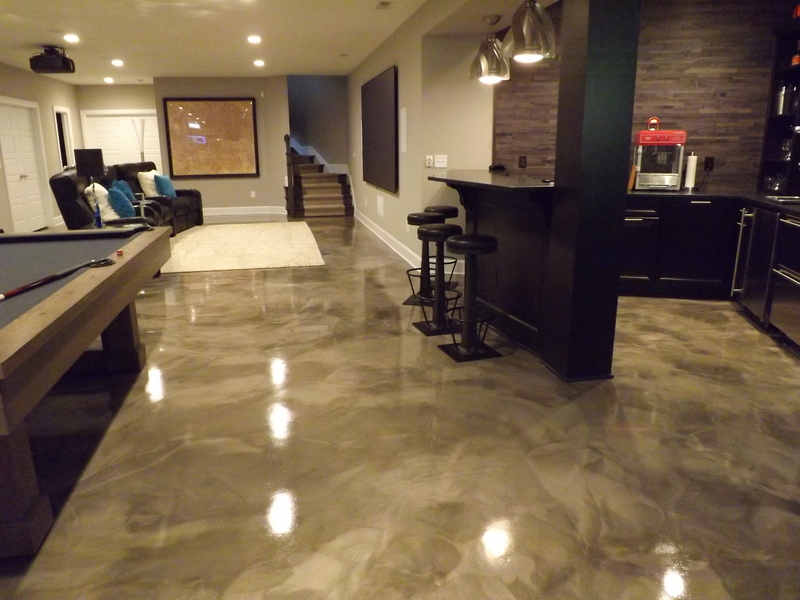 Now that you know about epoxy floors, its advantages and types of metallic floors too, let us tell you a bit more about Epoxy basement floors. An epoxy basement floor (i.e. a basement sealer) is pretty essential in order to secure the belongings of your house and prevent its foundation from getting subjected to the effects of leaks. Most of the solutions that are required to seal the floor of the basement floors and walls can be done by DIY methods. Some of these methods, however, require professional assistance. So, if you want to stop the leak from creating more problems, it is mandatory to identify where the leak is, at first. Once that has been figured, only then will it be possible to select the required sealant in order to fix the problem. If there are cracks in the floors and walls, they can be using epoxy sealers or cement and a putty cutting knife. 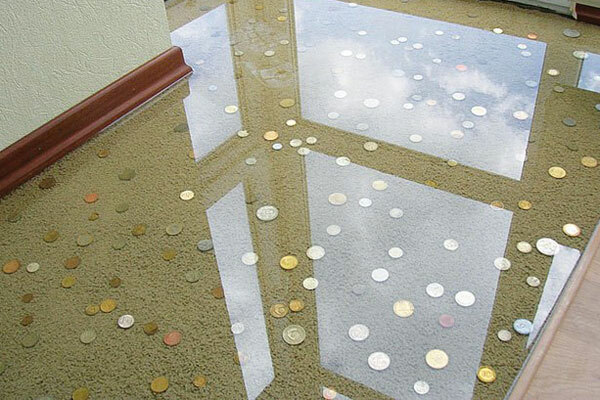 Even if you do not face any immediate crack or leak in the floors or walls of your house, you can secure it from future damage by the application of one or two layers of coats of the basement sealer. It is also essential for you to secure the basement in order to stop the water from entering the home through the foundation. Also, make sure that the face of the downspouts is pointed away from the base of your home. Clear the gutters of possible deposits of debris in order to allow proper drainage. Other ways of doing this can include digging up a trench for the purpose of keeping the water away from the foundation of your home. You can also install a French drain for the same purpose. 3D floors are preferred over other floorings because the decorations are quite seamless. To add to this, it is also quite affordable. It is not only extremely easy on the pocket, but also has the strength equivalent to industrial epoxy floors. Secondly, this kind of floors can only be installed by experts who are certified to do so. They are used all over the world. Third, they can be used for the purpose of various custom designs that yield amazing results. The final results will be extremely elegant and pleasing. The 3D floors are one hundred percent solids and have a custom flooring system of two components. 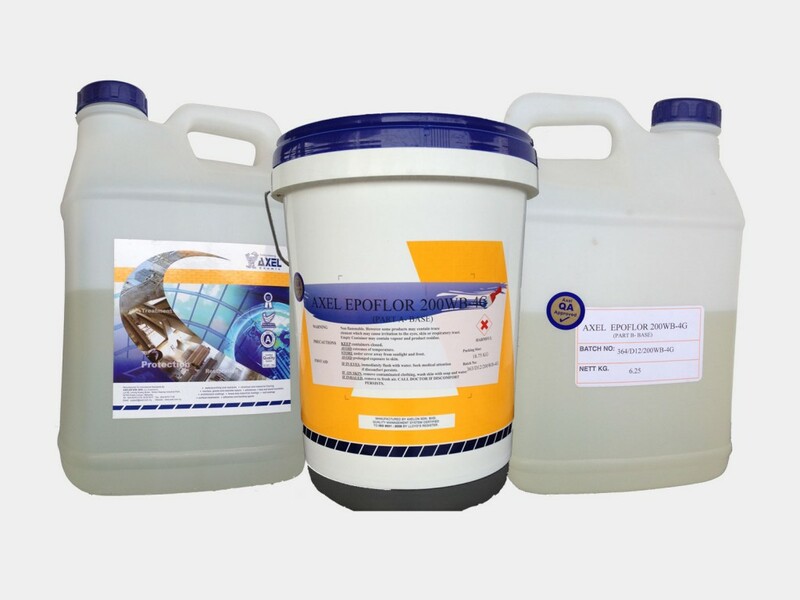 The manufactured material comprises a Poly-Crystallite product which is specially formulated. In order to make 3D floorings, the requirements include a coat of primer, a base coat generally TRX and a UV resistant clear coat which is one hundred percent solid. The final look has an appearance of glass and appears smooth. It has a unique sparkle that is reflective. An endless number of techniques can be used to create personalised effects for your business, garage or home. The design effect is such an effect which is loved by everyone. It creates a definite illusion of a design which the client wants. The Aquarium Colour Effect Floorings are used mainly for the bathrooms and those areas where the water world is apt to be placed. If you want a peaceful atmosphere to be created anywhere in your home, you can do so by using the Natural Scenes Effect. So, we found out how beneficial epoxy floors are in today’s world of manufacturing. They not only amplify the look of a place, but also make it look quite luxuriant. So, contact a manufacturer today and get your house renovated.